The Chancel Choir is a full adult mixed choir that sings for the 11 am Sunday service. Audition is not required. This ensemble is a unit of Chancel Choir that leads music at 8:30 am Sunday service. 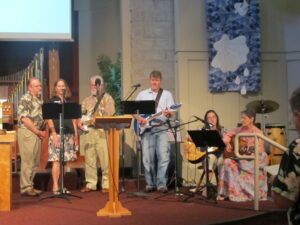 The Spirit Singers are a lively contemporary ensemble of singers and instrumentalists supporting the music ministry. It is the goal of this group to put on short 5-10 minute plays once a month on Communion Sundays and/or when the sermon may call for a dramatization of a story. Both children and adults are welcomed as actors. Our children’s choir rehearses Sunday mornings 9:45 am to 10:45 am and performs on the first Sunday of the month at the 11:00 am service. The choir is on hiatus each Summer and resumes weekly rehearsals the Sunday after Labor Day. The choir is a place where we have a lot of fun and where we form wonderful friendships through laughter, singing, and celebrating our faith with music. All children ages Pre-K through Fifth Grade are welcome to join us. The choir meets during the school year and can be a commitment for either the school year or for as little as a month. Our choir practice is held in the Teal Colored Room right by the playground. Our rehearsal time is designed with young voices in mind. New voices are always welcome regardless whether or not you have heard the music or not and I invite you to please come and join us. If your family is around on Christmas Eve, Children ages 2 through senior in high school are invited to participate in the annual nativity. You do not need to be a member of this church but if you would like your child to participate in a memorable Christmas Activity all are welcome. Rehearsals for the pageant begin the first Sunday in Advent. 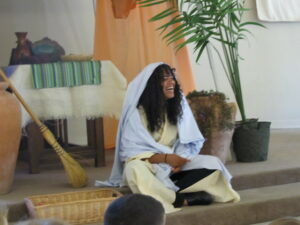 Children act out the Christmas Story as the scripture is read. (No memorization required).